Authentic Wwii Japanese Nco Sword? Ebay - Are There Any Consistently Reliable Sellers? 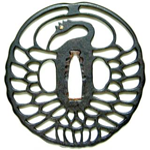 Antique Tsuba And His Faked Twin Or Two Fakes?